Ken McGoogan has published a dozen books, among them How the Scots Invented Canada, Fatal Passage, andLady Franklin’s Revenge. His honours include the Pierre Berton Award for a body of historical work, the UBC Medal for Canadian Biography, and an American Christopher Award for “artistic excellence.” After working as a reporter at The Toronto Star and an editor at The Montreal Star, Ken spent two decades writing for The Calgary Herald about books, authors, and publishing. Ken has served as chair of the Public Lending Right Commission, writes for such magazines as Canada’s History, Canadian Geographic, and Maclean’s, and sails with Adventure Canada as an author-historian. He teaches creative nonfiction through the University of Toronto, and in 2010 won an award for teaching excellence. 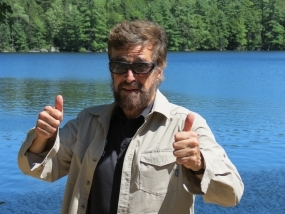 Ken has given talks and presentations in Sydney, Edinburgh, and New Orleans, and served as writer-in-residence in Stromness, Hobart, Fredericton, and Dawson City. He has signed with Patrick Crean Editions/ HarperCollins Canada, to publish new books in 2015 and 2017. Check out his website.